FRANCONIA TWP., Pa. (WPVI) -- Police say there is no danger from the suspicious devices outside a police station in Montgomery County. The bomb squad was called the Franconia Township police department around noon Wednesday. It all began when the father of a military servicemember, who is currently overseas, was cleaning his son's room and found several packages. The packages contained five clay bricks as well as an aluminum container that had wires protruding from the opening, police say. They appeared to be materials used to make explosive devices used for demolition. 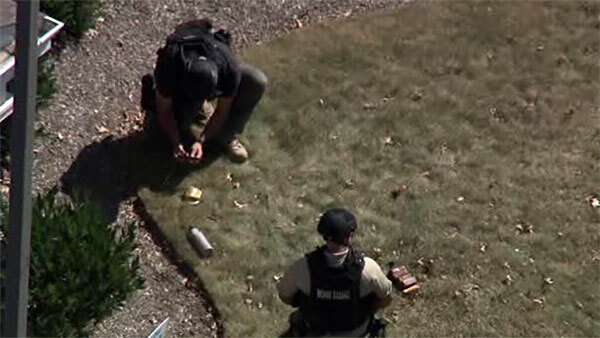 The packages were placed on the front lawn and the Montgomery County Sheriff's Department Bomb Unit was called, while residents across the street were told to shelter in place. Technicians initially thought they were dealing with live explosives, police say, but later found that they were inert, meaning they were most likely used for training purposes. The devices were removed and were set to be destroyed.